Industrialization and the concept of constant economic growth are among the leading causes of environmental problems and depletion of natural resources. As a result, the transition to sustainability requires adequate measures and participation by the global economy too by both the large multinational corporations and small businesses operating on a local level. However, sustainability and sustainable development do not necessarily have a negative effect on economic development and growth. Some types of businesses are without a doubt threatened with closure but the efforts to reduce the impact of industrialization on the environment also offer a number of business opportunities, especially for businesses focused on sustainable development and green technologies. As a result of efforts to introduce a sustainable system in all spheres of life including economic life, there will be an increased demand for environmentally-friendly and resource efficient technologies in industry too. The current economic growth mostly depends on non-renewable resources which are not only getting fewer but more expensive too. Better resource efficiency therefore is not only an ecological necessity but the key to operation cost reduction and in the end, the key to survival on the market. Companies that shifted to environmentally-friendly technologies and reduced resource consumption have a major advantage over the conventional businesses due to reduced operation costs and fewer environmental penalties as well as due to better reputation among the consumers. For that reason the demand for resource efficient technologies is expected to rise despite the fact that green technologies require a higher initial investment than the conventional ones. The future of environmentally friendly and sustainable technologies seems very bright due to increased demand among both industry and customers for both ecological and financial reasons. Companies focused on development of green technologies cannot meet the demands of the market yet leaving a lot of space for new green companies as well as investments. The products and technologies that are currently available on the market provide either insufficient resource consumption reduction or are too expensive for an average consumer. In addition, not all alternatives to the natural resources have been fully taken advantage and the competition is not as tough as in other fields of economy. The time for starting a business that provides sustainable technology or/and solutions was therefore never better. Ia addition to development of green technologies, the shift to a better sustainability also offers a number of opportunities in the recycling industry. 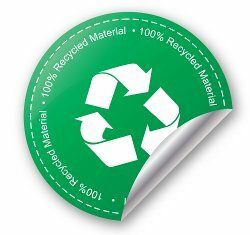 Most developed countries have made major steps towards improved collection of recyclable materials. Although the market for separated waste collection is mostly full, the statistics show that a large portion of waste is still disposed inappropriately and that more reusable materials could be obtained from waste produced by both industry and households. For that reason there is still enough space for new separated waste collection companies. But there are even more opportunities in the recycling industry itself because many countries that introduced waste recycling programs are faced with problems due to lack of recycling facilities.